Formally known as St Albans Diving Club, Dacorum Diving Club was founded on 28 May 1971 by Ted Salvidge. As a young man Ted had learned to dive while swimming, but his first real success in diving happened when he came 2nd in the RAF's Malayan Championships while completing his National Service in the RAF's Air Sea Rescue Service. An early influence was Tony Turner, the British Olympic Diver, who Ted trained with at Highgate Diving Club and Ted also competed at the British Senior Nationals in 1957. While still a member of Highgate Diving Club Ted was invited to the opening of Hatfield Pool to be part of a diving display and he subsequently worked as a coach there for the diving section of Hatfield Swimming Club. 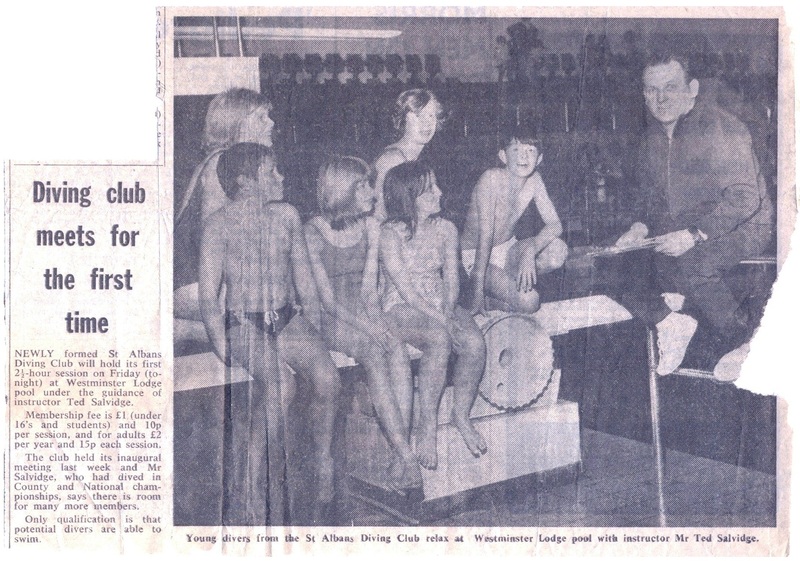 In 1971 another new pool was opened at Westminster Lodge Leisure Centre in St Albans and Ted was again part of the opening show and was then asked to set up a diving club there, which he did with the help of other founder members; Audrey Axtell, Adrian Fricker, Joan Ives, Jean Salvidge, John Turner and Sally Young (click on the clipping image left to see a full size copy). Ted became an ASA Assessor for Diving Teachers and was the Head Coach at St Albans Diving Club from inception until 1996. The founders' intention was to establish a competitive community club and we still work with this aim today. 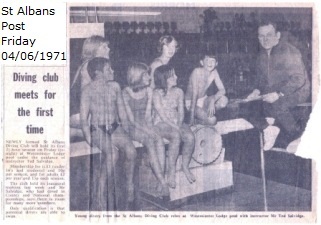 For many years St Albans Diving Club held some of its training sessions at Hemel Hempstead due to the fact that the diving boards at the old Westminster Lodge Leisure Centre were installed at the end of a swimming pool, so we always had to compete for water time with the local swimming club. In 2007 the club was privileged to receive a Sport England grant from the Community Club Fund, enabling us to purchase some new training equipment and the Hemel Hempstead site proved to be a much more suitable venue to site and use this equipment. The St Albans City & District Council has now rebuilt Westminster Lodge and in spite of constant pressure from the club and our sport's governing body has not included diving boards at the centre at all. We are of course bitterly disappointed with the council's decision to scrap diving in St Albans and believe this was a missed opportunity to grow our sport within the county and region. We had hoped that the new centre when completed would include improved diving facilities in a separate diving pit, which would have increased participation and could have led to the establishment of another new club (as we could have split between the two centres). Sadly we were forced to relocate to Hemel Hempstead completely instead. In contrast, Dacorum Borough Council and SportSpace's Hemel Hempstead Sports Centre have always been very supportive of our activities and so Hemel Hempstead now feels like our rightful home. In consequence, the members of St Albans Diving Club voted to change the name of the club to Dacorum Diving Club on 15th May 2010.